Iolan the Seabourne is the greatest elemental mage of her generation—or so she's being told. The one prophesied for years to be the savior of The Realm. It is her duty and destiny to face and defeat the Bane, the greatest mage tyrant the world has ever known. A suicide task for anyone let alone a sixteen-year-old girl with no training, facing a prophecy that foretells a fiery clash to the death. Elemental magic you say? I'm in. Ladies and gentleman that's pretty much all it took to get me to crave this book like the book junkie that I am. I love elementals (because they are SO cool) and I feel like I don't read nearly enough stories about them. Add that in to a high-fantasy premise and I am nearly salivating to crack open the copy they let me run away with at BEA. This is one of those books that I had to control myself not to read right when I got home - but I was a good girl and I am still waiting till closer to the release date to dive into this one. *eyes book* Soon. 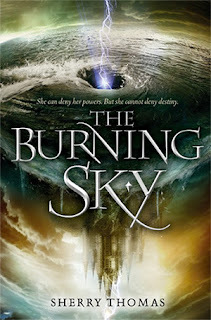 What do you guys think of The Burning Sky? Don't forget to link me up to your WoW posts! YAY! I'm really excited for this one too! I haven't read a good fantasy in awhile so I'm long overdue! I have an e-ARC of this that I will be digging into soon! Great pick Micheline! Awesome pick, I have gotten the book some time ago and it looks great. Haven't started it yet tho so I hope I do soon. Hope you get the book soon and enjoy it! I love the cover for this book, it's so cool! I can't wait to check it out as well. Great pick! I couldn't agree more, it's SO intense! Thanks Christy! Okay, the cover for this one is amazing! And I am definitely hooked by the synopsis of this one - elemental magic?! I am SO in. Great pick! You got an ARC too! I cannot wait to read this one. But they changed the cover. The one you posted is not the cover anymore. At least not in the US. And that's a shame because I liked this cover a lot better! Every reason you listed up there is a reason why I scream "I NEED THAT BOOK IN MY HANDS RIGHT NOW AND I WON'T REST UNTIL I GET IT!!" Needless to say I am so jealous of your arc. How can you resist it so long?! bahahaha yeah, my feelings exactly when I got in line at BEA for it! Believe me, if I didn't have other review books I have to get to, I would have caved SO fast! I really hope you can get your hands on it soon! I have an eARC of this one, and it's the most exciting thing evah!! I really can't wait to read it, but I'm a bit afraid my expectations are really high and I it won't work out well for me. But I can't resist Elemental magic either. And that cover is way awesome. The new one is OK too, I guess, but if they were both in the shop next to one another, I'd definitely be more likely to pick up the book if it had the cover you've shown. I have not seen this one yet ~ thanks for the 411 on it. Sounds so good! Totally jazzed for this one as well! MY PRECIOUSSSS!! Eeeeee, this book is totally up both our alleys! And the early reviews have been super good! I am a bit nervous... just because it almost sounds too good to be true and everyone is loving it and I would be sad if I didn't love it, as well! But I'm getting ahead of myself, haha. I do think I will love it, I just don't want to be let down from my high expectations. Fantastic pick!! I love stories with elemental magic too so I am really looking forward to this one. Thanks to Edelweiss I have it to read.